First off, kudos to Rene of Shoujiki Shindoi and reader Vitor for sending in the correct answer! Update: Also a kudos to Cocomino, whose answer got lost in the shuffle. Sorry! And now, the answer. If you'd like to try and figure it out for yourself, don't scroll down yet! The riddle asks, "What's the meat dish that everyone likes?" 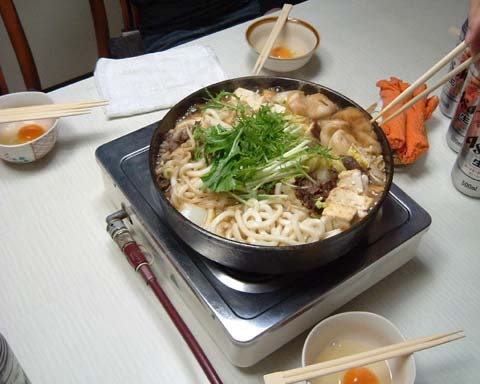 鋤焼き (Sukiyaki) is a traditional Japanese dish combining the words for "spade" (as in for gardening) and "cook." It seems that this name originated from the Edo period practice of cooking fish or tofu (or meat if it was available, I suppose) on the metal part of a spade instead of in a pot. Though 「すき」means "spade" in this case, it can also mean "to like." Hence it's the meat dish that everyone likes.